WHAT SHOULD I LOOK FOR IN A PASTA MACHINE MAKER? If you’re used to store-bought pasta, you might be ready to take things to the next level of deliciousness by making your own fresh pasta right at home. Making pasta by hand can be a bit tedious, though. Lucky for us, you don’t have to do it the old fashioned way. The best pasta machine makers can help you make fresh pasta quickly and easily. But before you hand over your money for a shiny new machine, there are a few things to keep in mind to ensure you get the best pasta machine maker for your “dough” (pun intended). There are two main types of pasta machines: manual and automatic. Manual pasta machines definitely make the pasta-making process easier, but they still require some work. 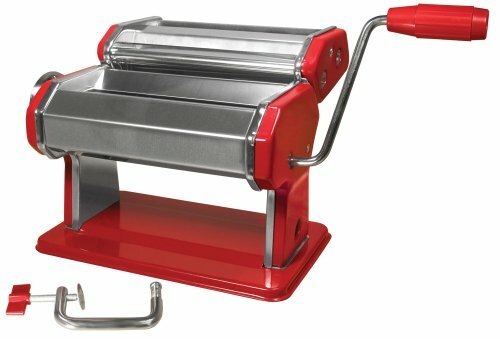 Manual pasta machines have rollers and a manual handle that you crank to make the pasta. They’re perfect for making long noodles like spaghetti and fetuccine. Manual machines are more affordable than automatic machines and can last for a long time. Automatic pasta machine makers do most of the work for you. They are more expensive than manual pasta machines, but they are faster and easier to use. They also allow you to make more pasta styles, including round pastas like macaroni and ziti. As you consider the best pasta machine makers, there are some factors to keep in mind. Do you anticipate using the machine once or twice per month? Or do you make pasta several times per week? If you’re an occasional pasta maker, a manual machine can easily meet your needs. If fresh pasta is an essential part of your diet, you may want to go for an automatic machine so you can make pasta more easily. Manual machines can also work well for making large batches of pasta; it just takes a bit longer. The hands-on experience of using a manual machine is appealing as well. Pasta machines can vary widely in price. Manual machines start as low as $15, and automatic machines start at around $75. As with most purchases, the brand is a big influence on the price. Higher quality brands may be more expensive, but they also tend to last longer. The price of pasta machines is also influenced by the number of different pastas you can make, how easy it is to use, and how easy (or hard) it is to clean. If you’re short on space, you want to look for a pasta machine with a smaller profile. Larger machines can make larger sheets of pasta, though, so it’s a balancing act. Most automatic machines are roughly the size of a coffee maker. Manual machines vary, and you can find machines that are 18 inches wide or more. If there’s a specific type of pasta you particularly enjoy, then you should look for a machine that can easily make that type of pasta. For specialty pastas like ravioli, you may need to purchase an attachment in addition to the pasta machine. Automatic pasta machines often have a wider range of pasta options, but the attachments available for manual machines can make them flexible as well. Pasta machines can be a challenge to clean. The dough can work its way deep into the crevices of the machine. If you can easily take apart the machine, that can make it much easier to clean. Even better if you can throw parts into the dishwasher, which is a more common feature with automatic machines. If you’re not the most patient person, you may want to consider speed as you shop for pasta machine makers. Manual pasta machines tend to be a bit slower, while automatic machines, with their electronic components are faster. The speed of automatic machines vary, so check reviews if this feature is a priority for you. Many manual pasta machines also have an option for buying a motor, which can give you the best of both worlds when it comes to making pasta. 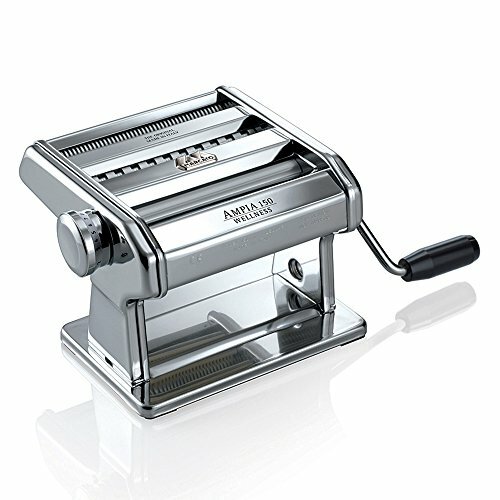 Any pasta machine is going to improve your pasta making experience. Electric models will do more of the work for you, including mixing and kneading the dough. Manual machines press out the pasta for you as you turn the crank, and they should be easy to adjust for different pasta thicknesses. They should include a vice to keep it secured to your table or kitchen counter. The handle should be relatively easy to turn. If you go with a manual machine, you can use a food processor or mixer to make the dough to make the process easier. Manual machines are more durable than automatic machines. They don’t have electric components that will wear out. Manual machines can have an extremely long life if they are properly cleaned and maintained. For the longest life when it comes to manual machines, look for models with all-metal and stainless-steel parts. 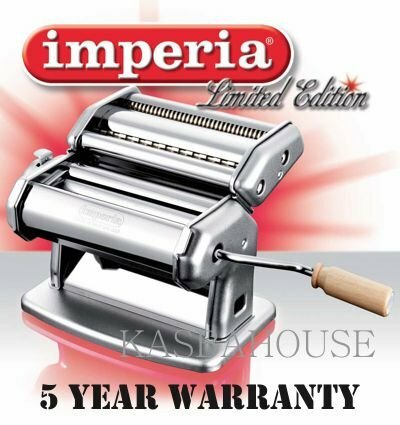 Many brands also offer a warranty, which is an important factor to keep in mind while you shop for the best pasta machine makers. Once you know what to look for in a pasta machine, the selection of pasta machine makers is nearly endless. Here are the best pasta machine makers, each of which will make your pasta making experience easier and more fun. 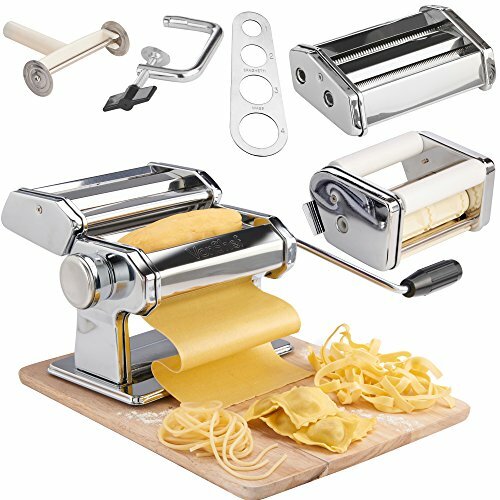 Since manual machines are affordable, durable, and fun to use, the top pasta machines are all manual models. They’re perfect for pasta novices as well as experienced pasta makers. The Weston Manual Pasta Machine is a small but mighty option for your pasta-making needs. Its attractive, bright red exterior makes it a welcome addition to any kitchen. Weston prides itself as a brand for food traditionalists and enthusiasts. Product Dimensions: 8 in. by 8.5 in. by 6.5 in. Check Price OR Read Customer Reviews on Amazon! The Marcato’s Atlas Pasta Machine has been called the Ferrari of pasta machines by Cook’s Illustrated. The machine easily handles a variety of pastas, and the Marcato name is associated with high-quality, durable machines. Product Dimensions: 8 in. by 8 in. by 7 in. 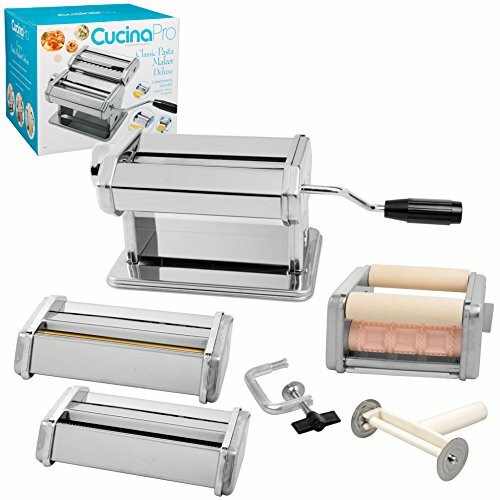 The CucinaPro Deluxe Pasta Maker includes everything you need to make a variety of pastas, including ravioli, spaghetti, and fettuccini. CucinaPro is a respected name in the culinary world and the company is dedicated to inspiring creativity. Product Dimensions: 8 in. by 7.75 in. by 6 in. 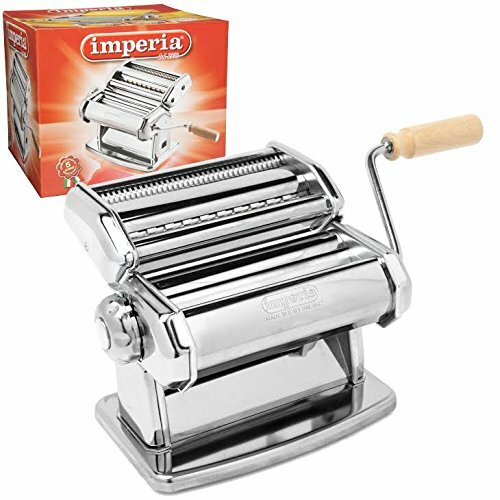 The Imperia Pasta Maker Machine is a solid machine that is made in Italy. It’s a high-end machine with a double cutter. You can easily adjust the thickness and it’s also simple to use, even for novice pasta chefs. Product Dimensions: 8.1 in. by 7.2 in. by 6.2 in. The Atlas Marcato Multipasta Pasta Machine Setcomes with everything you need to make a variety of pastas. It has a variety of thickness settings and includes hour removable cutting plates. Product Dimensions: 7.87 in. by 8.15 in. by 6.1 in. 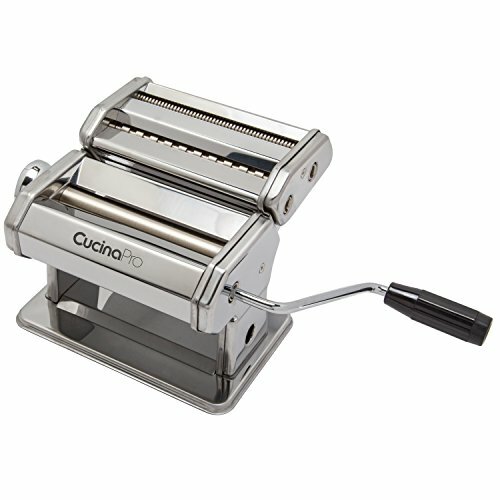 The CucinaPro Pasta Maker Machine is a sleek, sturdy addition to your kitchen. It’s heavyweight and durable enough for years of pasta-making enjoyment. It can make spaghetti, fettuccini with the included attachments, and you can purchase additional attachments for more variety. The Imperia iPasta Limited Edition is easy to use and simple to clean. Made in Italy, it’s versatile and can make tagliatelle and fettuccine with each. You can purchase additional attachments to make a wider variety of pastas. Product Dimensions: 8.3 in. by 7.3 in. by 6.9 in. 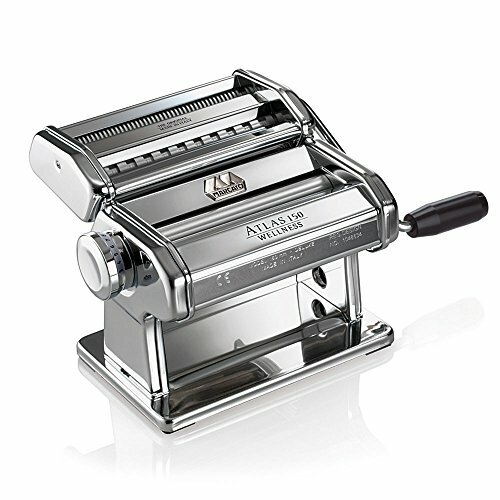 The Marcato Atlas Ampia Pasta Machine is a versatile machine that makes consistent, tasty pasta. It’s small but sturdy and fully adjustable. It’s made in Italy and comes from a brand known for its quality machines. Product Dimensions: 8 in. by 5.5 in. by 8 in. 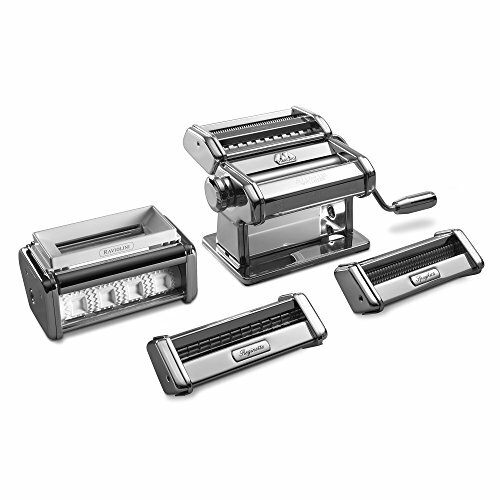 The VonShef 3-in-1 Pasta Maker Machine is able to make a wide variety of pastas easily. It’s made from sturdy stainless steel and can make spaghetti, fettuccine, linguine, and tagliatelle. Product Dimensions: 13 in. by 9.7 in. by 6.5 in. Attachments can add variety to your pasta-making experience. Common attachments include motors and ravioli makers. Attachments are available from Imperia, Marcato Atlas, and Weston. If you love pasta as much as we do, then having the ability to make fresh, delectable pasta right in your own kitchen sounds like a dream come true. But for most of us, making pasta by hand just isn’t a viable option (who has time for that). Luckily, the best pasta makers detailed in this guide are just what you need to make pasta fast…right in your own kitchen. Not all pasta makers live up to their reputation, but the models we’ve reviewed in this guide have lived up to the highest of standards and are worth a try.